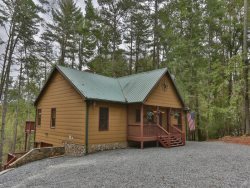 Honeybear Lodge - Toccoa River Access & 2.3 Miles from Downtown Blue Ridge! Dancing Bear - Great Cabin, Spacious and Comfy! Dancing Waters - 4 Bedroom Cabin on River! Absolutely Fab-VIEW-lous - Blue Ridge Beauty! River`s Bend - Incredible River Home! Rushing River Lodge - Backyard Whitewater Adventure!